Filed Under: The desert, a ghost town, the Mexican border; the time of your life. Appreciate: Las Casitas. While the Big Bend area of Texas is appealing because of its stunning natural beauty and remoteness, that same remoteness leaves few desirable options for lodging. 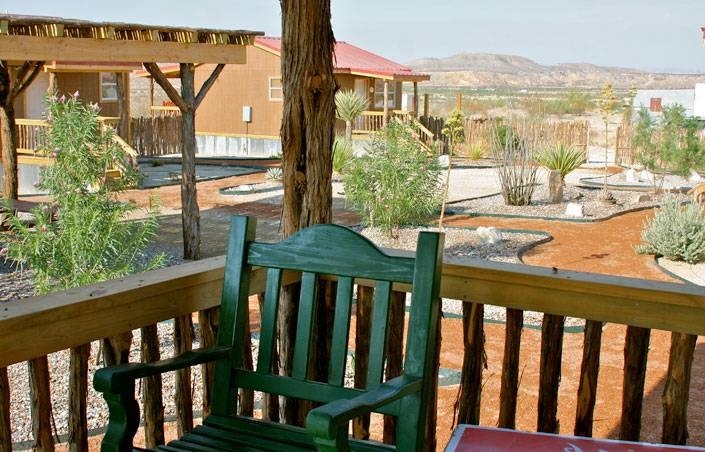 Las Casitas at Far Flung's Outdoor Center (pictured, top) are one exception: newly constructed casitas (with 6 more being framed, as of this writing) are available to keep you comfortable on your West Texas tour. Casitas translates to "cottage" or "little house," and you'll find a charming little village of them at Far Flung. Outfitted with kitchenettes (microwave, coffee pot and coffee, fridge, sink, toaster oven), air conditioning and heat, queen beds, showers, satellite-connected flat panel TV's, and, rare in this area because of the many adobe-walled structures: in-room WiFi. Of course, we suggest you stay off the Internet, and get outside to enjoy one of the many adventures planned by Far Flung's owners Greg & Valynda Hennington and Mark Evans. Or, if you don't feel adventurous, Far Flung will let you stay in a casita anyway. Fling yourself on the porch with a book, grill up some yums in the courtyard barbecue, or wander next door to Rio Bravo for authentic Mexican food. Maybe casitas really translates to "perfect"